Should You Trust the Virginia Tech Football Helmet Ratings? Explanation of the Virginia Tech STAR Rating for football helmets, and the benefits and objections to the study. Concussions have always been a part of the game especially in football. But what was once referred to as simply “getting your bell rung,” has now become an incredibly serious health concern, leading to mental degeneration, persistent physical impairments, depression, and death. Among players, parents, and coaches, the growing fear of, and focus on concussions, their effects, and prevention have become priority number one, and for many, the first line of defense is the football helmet. Concussions are the result of a complicated event, with many variables, forces, and factors, ranging from the acceleration of the player to his genetics. Yet, at the end of the day, parents and players just want to find the best helmet to protect themselves from injuries. Unfortunately, consumers are really looking for a simple answer to a complex question. After eight years of data collection, research, and experiments, in 2011, and again recently in 2012, Virginia Tech and their engineering department gave us an answer; the “STAR System” for rating the effectiveness of football helmets. STAR, or the Summation of Tests for the Analysis of Risk, is a rating given to helmets, meant to describe their perceived effectiveness at reducing the risk of concussions. 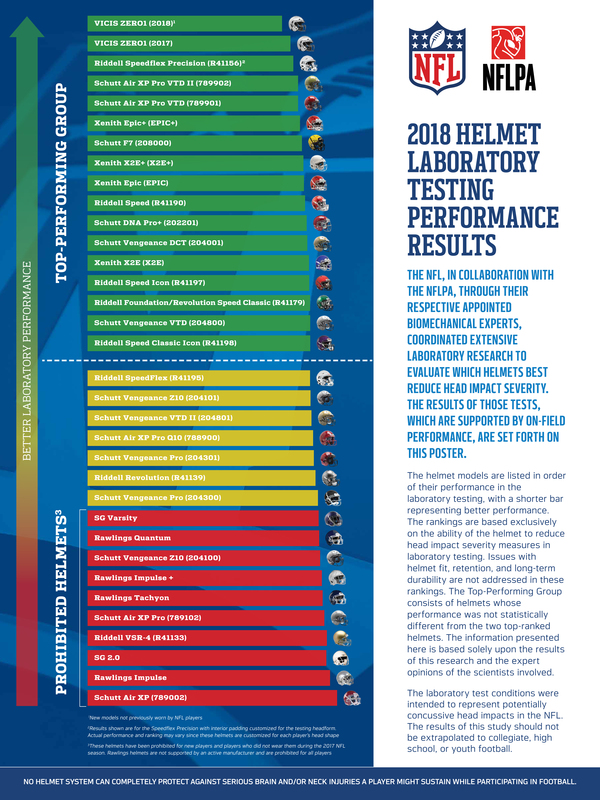 Each helmet is tested in an accredited lab, and using an algorithm developed by Stefan Dumma, lead engineer on the Virginia Tech rankings project, given a STAR value. According to Virginia Tech, this value is derived from 120 impacts on 3 new helmets, caused by dropping the helmet from a variety of heights, at four different positions, to simulate the range of helmet-to-helmet hits a player would experience on the field. After analyzing the results and data, the helmet is given a STAR rating, which attempts to define the number of concussions a player can expect to experience over the duration of one season, playing with that particular helmet. 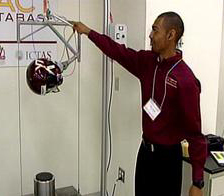 In 2012, Virginia Tech tested 15 adult large football helmet models using the STAR evaluation system. Helmets with higher STAR ratings provide a reduction in concussion risk, while those with lower ratings tend to provide less protection from concussions. 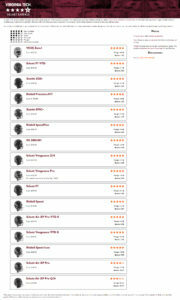 Below are the published results of the 2012 STAR football helmet testing performed by Virginia Tech. Most of these helmets can be found at Sports Unlimited. Please see the updated 2014 Virginia Tech Football Helmet Ratings. Since it was first introduced into the industry in 2011, the Virginia Tech STAR rating for helmets has received both praise for informing players and parents of the effectiveness of certain helmets, and opposition from independent organizations like NOCSAE (the National Operation Committee on Standards for Athletic Equipment) and manufacturers like Schutt and Xenith, accusing the study of dramatic limitations and misleading results. The controversy over the Virginia Tech football helmet study has grown heated in the past few weeks, following the publication of the 2012 results. Press releases and rebuttal statements from Schutt, NOCSAE, and engineers from Virginia Tech have cast the issue further into the public light, and have people questioning, at once, the validity of the STAR ratings, and the intentions of some of the most trusted manufacturers in the game today! Opposition from Schutt, NOCSAE, and others center on the authority of the helmet rating system and Virginia Tech’s methodology in the lab. Since the testing only focuses on lateral acceleration impacts (direct helmet-to-helmet contact) and ignores rotational impacts (the glancing blows that twist the head and neck), many believe its results and data are severely limited. Although respecting the tests and results as a leap forward in understanding the nature and prevention of concussions, NOCSAE and Schutt have both expressed concern that concussions are too complex an event to draw any strong conclusions by testing only one of many variables. 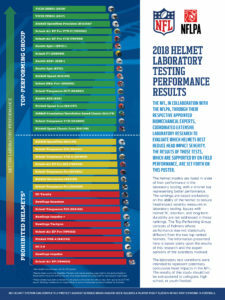 Schutt has taken their objections a step further, even though many of their helmets, such as the ION 4D and DNA Pro +, have received top STAR ratings in each test. Schutt’s objection to the Virginia Tech helmet study accuses it of prioritizing lower-velocity impacts over harder hits. In low speed impacts, softer helmet padding tends to perform better and absorb more shock, while at higher speeds, harder padding has been shown to protect players better. Typically, softer padded helmets are better at protecting younger players, who are generally not getting hit as hard as college or pro players. For instance, the Schutt 2012 AiR Standard II received a 5 STAR rating when tested by the same independent accredited lab, under the same conditions, and using the same algorithm used by Virginia Tech. In response to these accusations, the Virginia Tech team has admitted its limitations and explained that its STAR rating is merely meant as a research tool, not a buying guide. 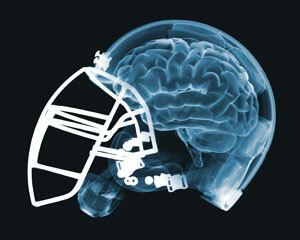 Their claim is that some information on the effectiveness of football helmets is better than nothing. In Virginia Tech’s helmet study methodology, the researchers directly describe the test’s limitations, admitting the complex, multi-faceted, and variable causes and nature of concussions. 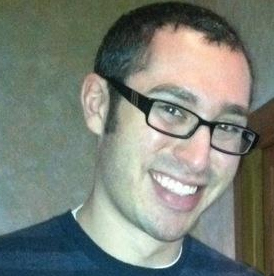 Admittedly, their numbers and rating system are simply based on trends and probabilities. While they also admit to only testing linear acceleration as well, the team explains that while all head impacts result in both linear and rotational accelerations, Virginia Tech engineers believe a correlation exists between the two forces. So, as they explore the one, they are also exploring the effects of the other. Obviously, this is a complicated issue, one based in science and sport, but also rooted in health and emotion. In our quest to provide the most well-rounded, up-to-date, and unbiased sporting goods information, we at Sports Unlimited have tried to present all of the facts and varying opinions on this developing issue. But to get the full picture, we need to hear from the people using this information and buying new helmets. So please, feel free to share your opinions and feelings on the Virginia Tech helmet ratings below! *Update: As it was not available for public purchase at the time, the Schutt Vengeance helmet was not tested in the VA Tech STAR Rating Study. However, using the same lab (Southern Impact Research Center in Rockford, TN) and publicly posted methods and algorithms as the VA Tech Study, Schutt independently tested the Vengeance, as well as others in its Varsity level helmet line. They found the Vengeance to score a STAR Value of 0.185. 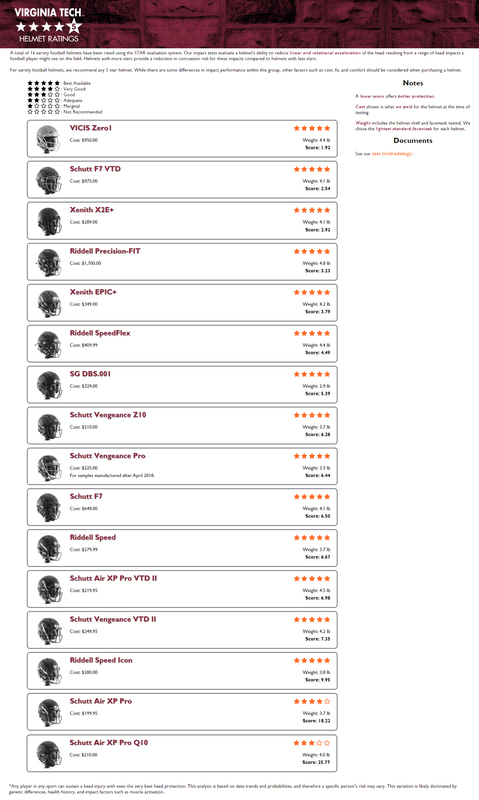 According to VA Tech’s publicly posted ratings, a 5-Star Helmet is rated between 0.200 – 0.299 STAR Value, while a 4-STAR helmet falls between 0.300 – 0.399 STAR Value. This would actually put the Vengeance above 5-STAR rated helmets. However, although their latest helmet is technically the highest rated, Schutt still believes the test to be inevitably flawed, and inaccurate of a helmet’s actual in-game performance and protection. Author AdministratorPosted on June 8, 2012 October 2, 2014 Categories Football, NewsTags college football, Controversy, football helmets, NFL, schutt, STAR Rating, Virginia Tech19 Comments on Should You Trust the Virginia Tech Football Helmet Ratings?